Pakistan Telecommunication Authority (PTA) has launched a special program for the promotion of Information Communication Technologies (ICT) Sector of Pakistan. 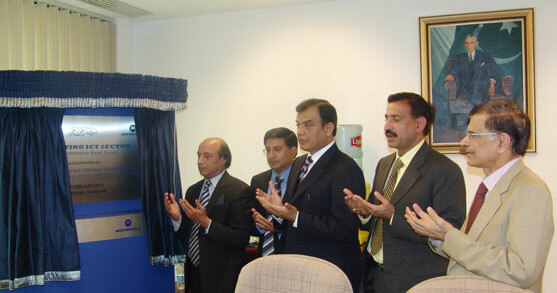 In this connection, an inaugural ceremony was held at PTA Headquarters, Islamabad wherein Advisor to the Prime Minister on IT, Sardar Muhammad Latif Khan Khosa formally inaugurated the PTA program while Parliamentary Secretary Interior, Capt (R) Rai Ghulam Mujtaba Kharal, Secretary Cabinet Division, Mr.Abdul Rauf Chaudhry, Secretary IT & Telecom, Mr.Naguibullah Malik, Chairman PTA, Dr.Mohammed Yaseen, Member (Finance) PTA, Syed Nasrul Karim Ghaznavi, Member (Technical) PTA, Dr. Khawar Siddique Khokhar and representatives of IT & telecom industry were also present on the occasion. Talking on the event the Chairman PTA said that Pakistan has emerged as one of the leading markets in telecommunications especially in the voice segment. In broadband sector, by December 2008, we had approx 250,000 broadband subscribers and within a span of one year, by December 2009 the figure has just crossed 600,000 showing a massive annual growth rate of more than 200%. However, at the same time, we still are lagging behind in overall broadband penetration. 600,000 subscribers reflects a penetration level of only 0.36%. This is where we require a mutual collaboration for development of local applications and content to promote usage of broadband in all spheres of life. He said, operators are looking for future revenue streams which are very much dependent on availability of value added data services. Key issue in further development of data segment is non-availability of local content and applications which can contribute towards ICT-based economical contribution. That is why, today, the PTA’s main focus is on the development of local content and applications, he added. Chairman PTA said that in reference to its endeavors for the development of ICTs in Pakistan, PTA has taken number of initiatives to launch and promote new innovative solutions for the betterment of telecom industry and society. As a part of such efforts PTA will now hold an exclusive conference on ‘Promoting ICT Sector’ on February 25, 2010 (Thursday). This conference is being organized in view of the importance of local content and applications for future promotion of ICT industry and infrastructure. As PTA is going to be promoting ICT. I think they don’t know the meaning of ICT. Yeah, the ICT is the acronym of Information Communication Technology but the question is that for what purpose they are going to be promoting it. They are promoting it to make our IT market best. But we don’t just focus on our IT market, we have to focus on our public where 70% don’t know the better meaning of ICT. We’ve to tell them that what is ICT. ICT is just not the knowledge of MS Word, Excel & blah blah blah… Using ICT we can make money. We’ve to tell the people living in backward areas that if they have talent, they have knowledge, they can write a column just not for a newspaper but for websites. Then these websites will pay you money. Another question is that why ICT Promotion why not I.T Promotion. IT is the field of knowledge while the ICT is phenomenon. How it is a phenomenon. As revolution is a phenomenon for the awareness of people that what is right and wrong like that ICT is phenomenon that how we can survive in the 21st century. Now we can’t just depend on a company without ICT. Division of Science & Technology, University of Education, Lahore has launched an ICT campaign in 2009 with name of NICTAC (National ICT Awareness Campaign) under the supervision of Dr.M.A.Pasha (Director Division of Science & Technology, University of Education, Lahore). We started it from our university that first of all we’ve to teach our students that we are living in exponentional times and we can survive now by using ICT. And Inshallah, we’ll soon launch it publicly so that we can teach our people living in backward areas and for those people who have talent, who have knowledge but don’t know how to use it. PTA’s ICT promotion is just for IT market but our ICT campaign is for our nation. Of course, PTA is working for Information technology market. you are very true partner we should aware the peoples who don’t know the actual meanings of ICT and PTA should also focus on our low level populatoin……. My driver does not know how to spell “Car” but he is excellent driver. I don’t argue that PTA’s team knows the meaning of ICT or not but I am pleased that they are heading towards a right direction. Think of the positive side, …. a revolution is happening in IT or ICT field! “According to the FCC, about 93 million Americans don’t use fast, broadband Internet, citing cost and complexity as a factor in their refusal to enter the 20th century.